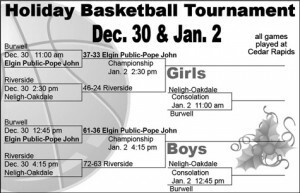 Both the boys and girls Wolfpack basketball teams won their first round Riverside Holiday Tournament games yesterday. They advance to the Championship games to be held on Friday in Cedar Rapids. The girls will take to the court at 2:30 p.m. The boys will tip-off at 4:15 p.m. Good luck to both teams!